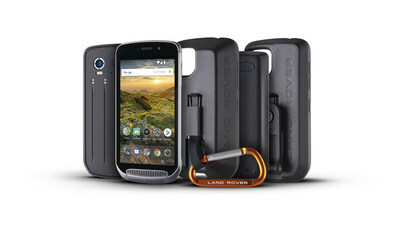 Land Rover and Bullitt Group have unveiled details of the Land Rover Explore Outdoor Phone. Designed for people who live for adventure and need a phone that can survive whatever it's put through, the smartphone will be on show at Mobile World Congress 2018, Barcelona, 26th February to 1st March 2018. At the heart of the Land Rover Explore is a powerful 4000mAh battery that gives two days of typical use, or a full day of activites, with constant GPS Navigation mapping activated on the 5" HD display. Battery life can also be doubled by adding the included Adventure Pack while on the go. Once added, it can replace the need for a separate GPS device with its GPS patch antenna that improves the reliability and accuracy of the GPS. It also adds additional 3600 mAh of battery power and premium topographic mapping with Skyline augmented reality, courtesy of ViewRanger. Notable features also include a bright 5-inch full HD screen that's optimised for sunlight legibility, while the touchscreen can be controlled with wet fingers or while wearing gloves. Improved connectivity options are provided by a dual SIM feature, giving users the ability to connect to two networks. Joe Sinclair, Director of Branded Goods and Licensing for Jaguar Land Rover said: "We are excited to be collaborating with Bullitt Group to create the smartphone that we'd all like to own. A perfect combination of design and functionality that embodies the Land Rover DNA and enables customers to be outdoors for longer, with the confidence to go further." Peter Stephens, CEO of Bullitt Group, global mobile licensee for Land Rover commented: "Building on our leadership in the rugged mobile market, we see the growing customer dissatisfaction with the fragility of their mobile phone and the poor battery life in particular, preventing them from using their mobile for key parts of their day to day life. The Land Rover Explore embodies everything we know to create a device perfectly suited to any outdoor activity, whilst retaining a sleek design." Bullitt Group's Head Office is in Reading, England with additional office locations in Taipei (Taiwan), Shenzhen (China), New York (USA)and Singapore. Since 1948 Land Rover has been manufacturing authentic 4x4s that represent true 'breadth of capability' across the model range. Defender, Discovery, Discovery Sport, Range Rover, Range Rover Sport, Range Rover Velar and Range Rover Evoque each defines the world's SUV sectors, with 80 per cent of this model range exported to over 100 countries.